Am I glad I did!! Woohoo!! Chocolate Chip Cookies!! I’m not even kidding… 3 ingredients, literally! And only 15 minutes to bake! Ready? Step 1: Mash 2 large, old bananas. 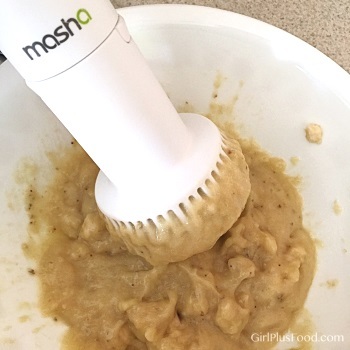 I used my Masha (which uses a low speed rotor to force ingredients through an outer mesh… I LOVE this thing!) for a perfect consistent mix in seconds! 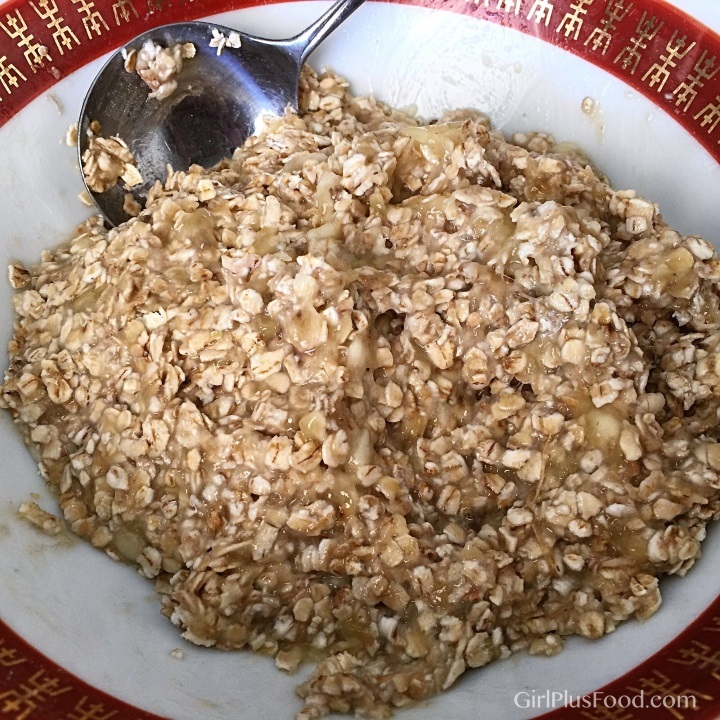 Step #2: Add a cup of oats and mix well. Smash the bananas and mix in the oats well. Spoon them on to a cookie sheet and bake at 350 degrees F for 15 minutes. 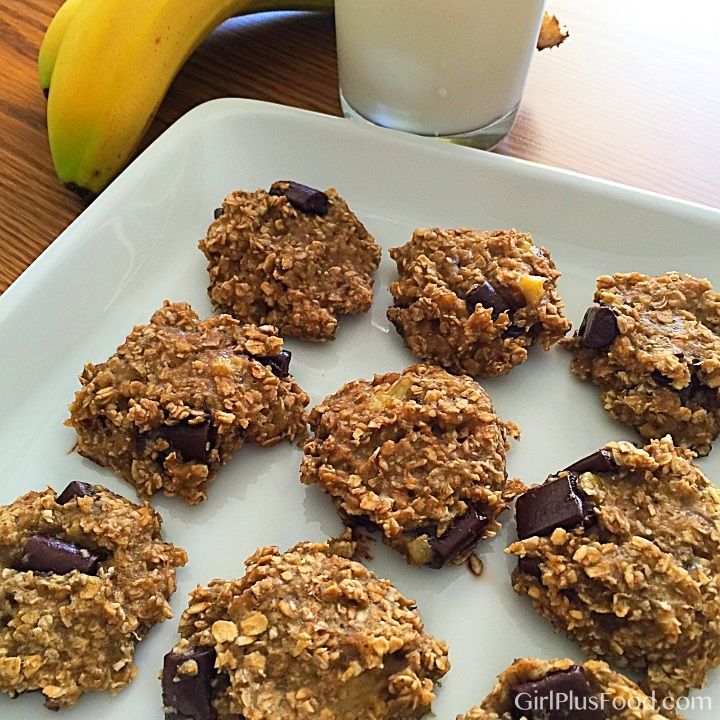 Delicious, quick & simple, healthy cookies! 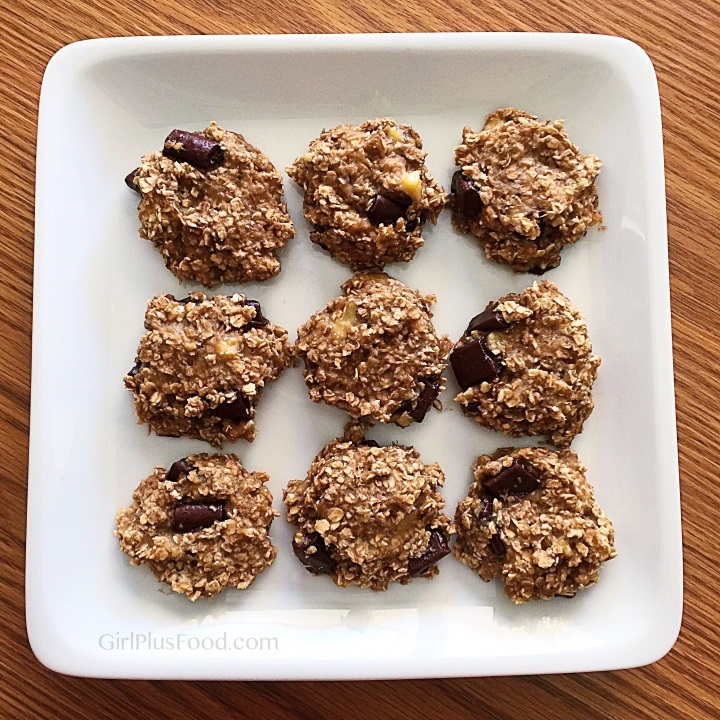 These are pretty healthy… I mean, seriously… bananas, oats, and some chocolate chips (which you can leave out if you *must*)! JRoc loved them soooo much!! I baked a dozen as a “test batch” and they disappeared as I was transferring them from the cookie sheet to the plate… YUMMEH!! This recipe rocks! I counted out the calories according the recipe with semi-sweet chips and found that if portioned out to 12 cookies, each turned out to be 55 calories. Instead I added the chips after spooning onto pan–kind of like birds’ nest cookies. That way the chocolate didn’t burn nor the cookie stick to the pan quite so badly. Thanks for the great diet friendly cookie idea!! These look amazing!!!! How long do they keep??? Like regular cookies? Do they freeze well? I have to admit… they’ve never been left uneaten for longer than 24 hours…lol. I would think the “dough” would freeze well since it’s only bananas, oats, and chocolate chips! Can I bake them in a pan and cut them into squares? I’m looking for something I can grab from the freezer on a hectic morning. If I make them into 6 squares with just a few less chips, it will be right around 100 cals. I’ve made them into cookie bars also and they turned out just as yummeh! I’ve never tried combining the two, but I’d imagine what would happen is… delicious magic! I threw in a tablespoon of PB2 and these were yummy. I even diced prunes and the kids loves these. I must have done something wrong. I spooned out about 10 cookies, after 15 minutes, they were way too mushy. 5 minutes with the oven off, and still too mushy. Revoked for another 15 minutes, and the edges got too crunchy, and the venters were still too mushy. What did I do wrong?? I’m going to make these as a healthy party favor at my sons 1st birthday party. So how long can they stay on the counter after baked? Made these and they are really good. I had the same problem as another comment where they were browned outside but still too chewy inside. I think making them as bars or flattening them would fix the issue. All in all I love these and will make them again for sure! I used the back of the spoon to make a little dent in the tops before baking and that worked perfectly for me. Does anyone know the weight watcher smart points are on this recipe? Has anyone tried these with raisins? Hi Pam! I’m not familiar with weight watcher smart points… but here’s Nicole to the rescue!!! Thank you!!! 🙂 Hope y’all are able to enjoy these!!! We’ve used dark chocolate and cocoa nibs but haven’t tried coconut… that sounds DELICIOUS!!! Does it have to be quick oats? I ha e a huge tub of rolled oats, if hate to have to buy another tub of oats! Lol. I have a whole bunch of way past their prime bananas just waiting for this recipe. 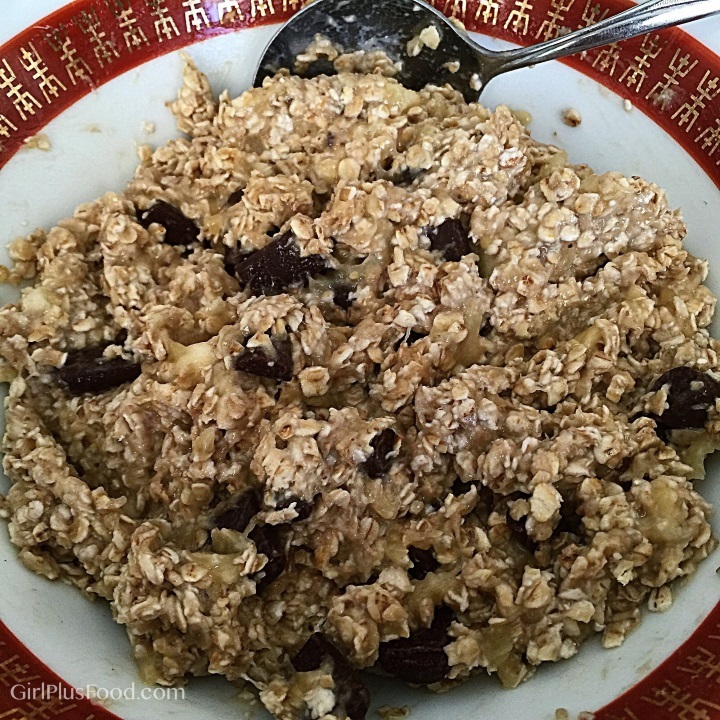 Rolled oats will do just fine… I’ve tried both and they turn out the same!!! This may be a weird question for a recipe with only 3 ingredients but do they have a strong banana flavor? 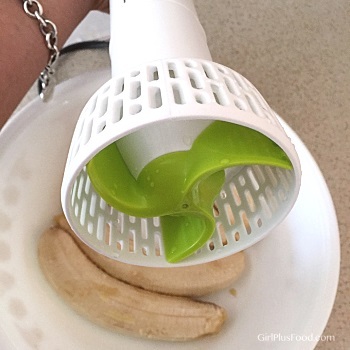 I hate bananas– their flavor and their mush. The mush keeps me from eating traditional oatmeal…? However, I love oatmeal and chocolate cookies and am drawn to the cleanliness, ease and practicality of these cookies. I’m trying to start eating my age ? I added some peanut butter powder, coconut sugar, and vanilla and they were AMAZING. I might have inhaled three as soon as they came out of the oven. I tried these and I liked them but I wanted to know the calorie content. Of course I know it will vary if you modify the ingredients. I used your recipe. What is the calorie content? I made 15 cookies. Hello! What do you think I can substitute for bananas? Thank you very much!